The Southern-Fried Gaming Expo (SFGE) is a 3-day fan convention focused exclusively on gaming. The expo is held June 8-10 at the Renaissance Waverly Hotel in Atlanta, GA, and boasts over 250 full-sized arcade games, pinball machines and console systems, along with tabletop gaming, vendors, special guest speakers, a film fest, live music, wrestling, tournaments and more! SFGE is a family-friendly event that will be fun for all ages. As a pinball designer, Mr. Ritchie has created some of the most popular and best-selling games of all time including Firepower, Star Trek: The Next Generation, Terminator 2: Judgement Day, ACDC, and the recently released Star Wars. Steve joined Atari as one of their earliest employees in 1974 and over the course of his career has worked for Williams, Bally/Midway, and currently designs games for Stern Pinball. Mr. Ritchie’s talents are not limited to pinball, however. Many gamers will recognize his voice as that of Shao Kahn (“FINISH HIM!”) in the groundbreaking Mortal Kombat video games. For the past twelve years, and over 500 episodes, John Jacobsen has been a co-host on one of the longest running independent video game shows, and Xbox Live Community Podcast Of The Year, The Video Game Outsiders on the comedy network, Riotcast. In 2007, John was sucked into the classic arcade collecting world. His first machine was a Donkey Kong, his second a Ms. Pac-Man, within a year he turned his basement into his own personal arcade. Soon after John got his first arcade game, he started a website and weekly YouTube series called “John’s Arcade” and he immediately had a passionate following. Each week John takes his viewers on his arcade adventures in the form of road trips across the country visiting notable private and public arcades as well as gameplay and tech videos. John also shows his viewers how to restore and fix classic arcade games in a “you can do this!” type presentation. John’s Arcade currently has approx. 32,000 subscribers and over 6 million Youtube views. John’s Arcade can also be seen on over a dozen public access channels across the USA. In late 2016, John and his long time friend Jay, took their hobby the next level. Partnering with the Hangar Pub and Grill and Amherst Brewing in Amherst, MA, they put over 30 arcade machines on location in a busy college town. Some of your favorite pinball games wouldn’t be the same were it not for the skills of our newest guest, Orin Day. Mr. Day was part of the development team of Data East Pinball and remained on board when that company became SEGA pinball, and finally stayed through the transformation into the Stern Pinball we all continue to enjoy to this day. Mr. Day has programmed and developed software for over 20 of the best games in pinball including Baywatch, Independence Day, South Park, and more. We’re glad to have Mr. Day as a special guest at SFGE 2018! SFGE memberships are available online and you can save $5 with coupon code JOYSTICK. Edited by sdewitti, Sat Mar 31, 2018 10:14 AM. Looking forward to SFGE .. My wife and I are bringing our Asteroids Cocktail and Rally-X Cabaret for free play. Also Vectrex, Astrocade and Channel F for show and play. Loads of fun!! 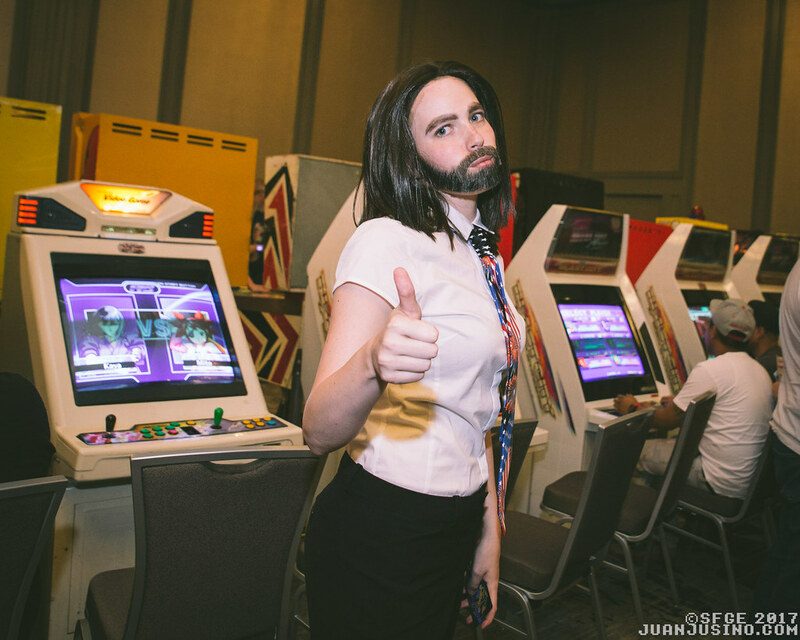 Any bets that the Billy Mitchell cosplay won't be popular this year?